An elaborately packaged blood sample arrives in the laboratory under tense circumstances. Laboratory technicians record the patient data and decontaminate the outer envelope before introducing it to a negatively pressurized glove box. Only after the sample is inside, they prepare the whole blood for RNA extraction and quantitative PCR—all of which are carried out in the biosafety compartment. Such extensive precautions for a blood sample from a patient with a fever, muscular weakness and flu-like symptoms have become imperative for healthcare workers. It is likely that this patient lies in an isolation ward, and the healthcare providers practice universal precautions, in which the precise and deliberate donning of personal protective equipment (PPE) must be strictly observed to avoid being contaminated. During an Ebola virus outbreak, such care must be used in all suspected cases of infection. The laboratory itself did not always exist in this location. It is a mobile laboratory, set up in a tent or spare room in the hospital, dedicated to performing molecular diagnostics for Ebola infection. 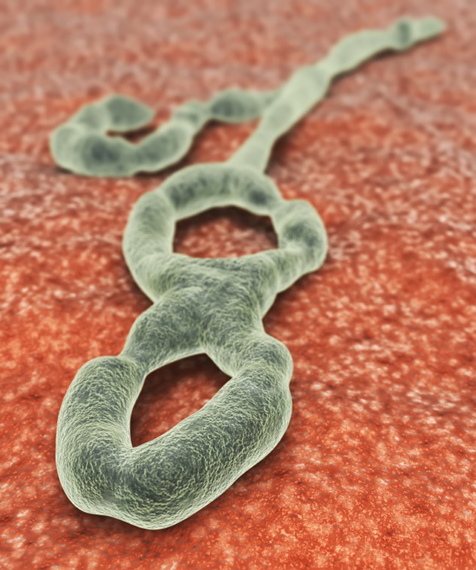 Within four hours of receiving the sample, results are returned: either the patient is infected with Ebola virus and must stay in the isolation ward; or has another illness and a much better prognosis. The role of laboratory professionals during an infectious disease outbreak is fraught with risk and complications. This is especially true for Ebola virus disease (EVD), a highly infectious and politicised disease that has no cure, of which a recent outbreak has already claimed the lives of many community members and healthcare workers. An important aspect of outbreak response is coordination; laboratory workers must effectively operate collaboratively with key partners to support the broader response effort, which includes providing universal access to diagnostic testing and other supportive services. Strong partnership amongst local, regional and international stakeholders—including the Ministries of Health (MOHs), the World Health Organization (WHO), implementing partners and community members—is vital; without this, the operational needs of laboratory workers, and the benefit they bring to the outbreak response effort, cannot be properly understood. How do laboratories in Ebola-affected areas deliver and sustain their vital services while navigating these multifaceted partnerships? This article will discuss the various key players with whom laboratory workers collaborate during an outbreak response, how mobile laboratories operate within such a coordinated effort and the essential integrated role of the community. During an outbreak, such as the current Ebola crisis in West Africa, the MOH functions as the voice of a country, offering leadership to bring the situation under control. Health ministers interact closely with and through the WHO, and rely on the support of a large network of partners who function together to implement results-driven infection control programmes. With so many groups working together, coordination requires purposeful effort, in order to reduce miscommunication, redundancy and missed opportunity in the implementation of control efforts. At a regional and global level, the WHO’s representation at outbreak sites is meant to “ensure that all the teams that are sent to the ground are working in a coordinated and sustainable manner so that we can have good results,” described Dr. Jean-Bosco Ndihokubwayo, Programme Manager for the WHO Regional Office for Africa, (WHO-AFRO), whose current role involves assisting the government of Guinea to control the Ebola outbreak. 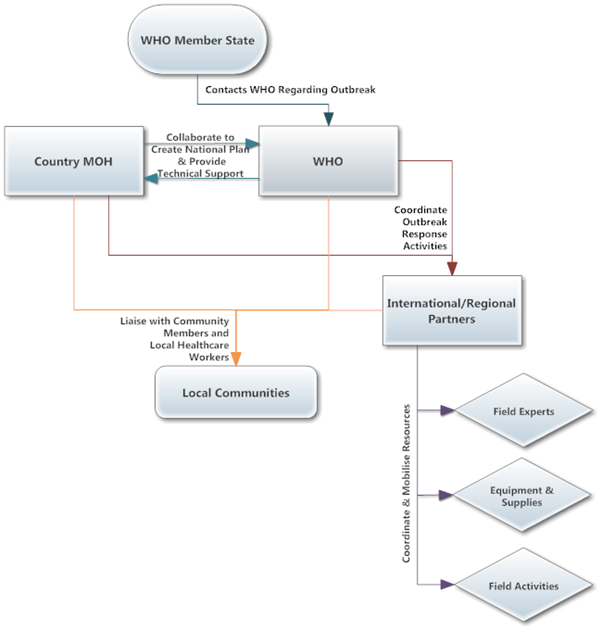 Bolstering the work of the WHO and MOHs, the Global Outbreak Alert and Response Network (GOARN) , established in 2000 in collaboration with WHO and other health agencies, aims to provide rapid multi-disciplinary assistance to outbreak sites. GOARN works with partners to deploy laboratory, clinical, field epidemiological, infection control, logistics and social mobilisation experts to assess the situation, and to implement a plan of action to address the local needs of the community and country affected by an outbreak. GOARN, along with WHO, maintains operational coordination of partners through regular meetings, teleconferences and situational report updates that are created by key partners. ASLM also has on-going activities for strengthening laboratory systems for improved early disease detection, surveillance and outbreak investigation. As such, the organisation is developing technical guidance on laboratory preparedness and response to the Ebola outbreak, and driving the establishment of an African Public Health Laboratories Network (APHLN). Interaction between country MOH, the WHO, partners and the local communities during an outbreak response. The importance of rapid, accurate diagnoses is acknowledged by both international and local partners. Increasingly, outbreak response experts have sought to find alternatives for laboratory testing sites for providing such diagnoses. During outbreaks, concerns including transportation of specimens, the rapidly-changing nature of the outbreak, poor infrastructure, and the danger of transmission require alternatives, especially as some outbreaks occur many kilometres from where complex diagnostic testing can occur. Accordingly, GOARN has facilitated mobile field laboratory operations and the provision of technical laboratory experts to detect early cases during an outbreak, including the current Ebola outbreak. According to Dr. Antonino Di Caro, who is working with the European Mobile Laboratory Consortium (EMLab), a partner in Ebola response funded by the European Union, the mobile laboratories are “deployed in the framework of GOARN to provide laboratory support to the Ebola outbreak response in the field.” During a recent interview, Dr. Di Caro noted that several European research and public health institutions and African partners are involved in the EMLab project and that WHO and Médecins Sans Frontières (MSF) have provided essential logistical support. Various groups are brought together within the EMLab Consortium to help countries with limited capacity to identify epidemics early. Institut Pasteur Dakar, the National Public Health Agency of Canada and the National Institute of Communicable Diseases (NICD) of South Africa are amongst a select group of other organisations that have mobile laboratory capacity for use in outbreak response. Mobile laboratories help increase access to diagnostics by minimising the distance between sample collection and testing site. According to Dr. Di Caro, mobile laboratories “can provide results in a few hours directly to the treatment centres and local public health authorities, supporting both isolation and contact tracing procedures.” The ability to provide prompt information on patients’ disease status allows uninfected patients to be released from isolation and safely integrated back into the community. On the other hand, if a patient is infected, staff can quickly begin tracing his or her contacts to reduce transmission in the community. Faster diagnosis can also provide critical information to families of the deceased such that timely burials can be conducted where possible without fear of spreading the virus. A common difficulty in Ebola virus identification in West Africa is the differential clinical diagnosis between Lassa fever virus (LAFV), which is endemic in the region, or other pathogens. A study published in Emerging Infectious Diseases journal in July 2014 found that 30-40% of suspected Lassa cases from Kenema hospital in Sierra Leone (2006-2008) were confirmed as LAFV, while the remainder of suspected LAFV cases were caused by Chikungunya, Dengue, West Nile, Yellow Fever, Ebola, Marburg, and Rift Valley Fever viruses. Mobile laboratories offer the ability for differential diagnosis, thus improving clinical management support in real-time, and providing additional health services to the affected community. Some mobile laboratories have the capacity to conduct broad-spectrum diagnostics, such as multiplex quantitative real-time PCR (Q-RT-PCR) with fluorescently tagged probes, which allows for the testing of multiple pathogens in one patient sample in one run. Moreover, lateral flow rapid tests for malaria have been regularly performed in EMLab’s mobile laboratories during the current Ebola outbreak. Researchers in mobile laboratories have also developed dry chemistry tests that do not require cold chain and that can be used to test for risk group 3 infectious agents. The ability for differential diagnosis by laboratories during a disease outbreak can serve as a great benefit to the community. 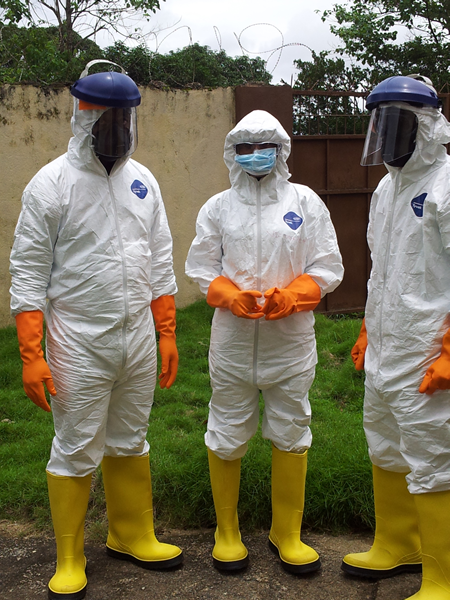 Healthcare workers in Sierra Leone wearing personal protective equipment. Image reproduced with the kind permission of Mr. Rashid Ansumana. While mobile laboratories can be used as part of a strategy that facilitates diagnostic access, there are limitations and challenges. For one, mobile laboratories are expensive, and require significant resources to run effectively. Concerns about biosafety measures for healthcare workers have also been raised. However, with careful collaboration and broad international support for addressing EID outbreaks, such limitations can be mitigated. With increased partnership, mobile laboratory directors can more easily attain resources needed from local partners, such as space for their facilities, transport within the country and security support to perform their jobs with maximal positive impact to the community. Of equal importance to infection control and outbreak response programmes is community engagement through social mobilisation. According to Dr. Ndihokubwayo, social mobilisation is “a very important part of Ebola outbreak management, because the population has to have the right information and take the appropriate measures to protect themselves and to collaborate with healthcare workers and other stakeholders to put in place Ebola control measures.” For example, home treatment of febrile illness caused by Ebola virus has been a major factor in the spread of the current outbreak. If communities in affected areas can be encouraged to seek medical care earlier, the prognosis for individual patients improves and the spread of infection can be hindered. However, despite community engagement efforts, some communities are sceptical of healthcare workers, including laboratory professionals. Laboratory work is, by its nature, bound by strict procedures, and in the case of Ebola requires special precautions such as the use of protective clothing. Thus, what goes on inside laboratories can easily be misconstrued by community members. Laboratory activities sometimes result in local rumours and hesitancy on the part of community members to comply with infection control processes or research activities ; this can have devastating consequences on outbreak response efforts. According to a recent survey conducted by the non-profit organisation Samaritan’s Purse, 92% of 1,000 people surveyed in Liberia said they do not believe Ebola exists. Therefore, in some places a critical step to addressing Ebola may involve confronting social constraints to Ebola outbreak control. Accordingly, adapting an outbreak response effort to align with the community’s needs can be productive. “Local populations have the knowledge, cultural logic and practices that arguably can and should be integrated into [outbreak] responses,” says Dr. Melissa Leach, Director at the Institute of Development Studies in Sussex, England, who has been closely involved in medical anthropology in Africa for 25 years. While some pieces of an outbreak response – following protocols, for example – cannot change, the approach to explaining the procedures to local populations can. Social science research can also help inform future outbreak response. In the first sociocultural study of an outbreak of Ebola conducted in Uganda, authors showed that while some cultural beliefs may be in opposition to the actions needed to curb an outbreak, the local community has a lot of knowledge about surviving epidemics, which could be useful for outbreak control efforts by international players. Awareness and sensitivity surrounding such beliefs can help healthcare workers disseminate clear messages in accordance with the cultural norms of the setting. All healthcare workers, including laboratory professionals, have an obligation to work in partnership with key partners and organisations to create positive narratives and facilitate an understanding within the community about laboratory diagnostics and outbreak response. Dr. Ndihokubwayo, describing the multi-coordinated efforts that have been undertaken, said “teams in Sierra Leone, teams in Liberia, [are] working closely with teams in Guinea, sharing information and sharing samples.” It is with great hope that these principles can be strengthened, replicated and circulated amongst agencies and across cultural divides to curb the damage done by the Ebola virus outbreak and ultimately save human lives. For more information about the current Ebola outbreak, please visit www.who.int/csr/disease/ebola/en. Ebola in Sierra Leone: a call for action. (5 July 2014). The Lancet, Vol. 384, No. 9940. The mobile laboratory units. (2014). EMLab. Retrieved from: http://www.emlab.eu/units.html. Undiagnosed acute viral febrile illnesses, Sierra Leone. (July 2014). Emerging Infectious Diseases Journal, Vol. 20, No. 7. Flexibility of mobile laboratory unit in support of patient management during the 2007 Ebola-Zaire outbreak in the Democratic Republic of Congo. (September 2012). Zoonoses Public Health Journal, issue 59, supplement 2. Oldach, L. (20 July 2014). Written interview with Antonino Di Caro. Cultural contexts of Ebola in Northern Uganda. (October 2003). Emerging Infectious Diseases Journal, CDC. Vol. 9, No. 10.